On April 12, the Ad Hoc Committee on Religious Liberty of the U.S. Conference of Catholic Bishops (USCCB) issued a document, “Our First, Most Cherished Liberty,” outlining the bishops’ concerns over threats to religious freedom, both at home and abroad. 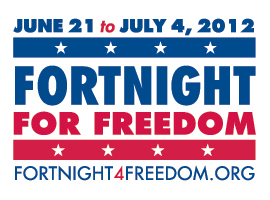 The bishops called for a “Fortnight for Freedom,” a 14-day period of prayer, education and action in support of religious freedom, from June 21-July 4. Bishops in their own dioceses have been encouraged to arrange special events to highlight the importance of defending religious freedom. Catholic institutions are encouraged to do the same, especially in cooperation with other Christians, Jews, people of other faiths and all who wish to defend this cherished freedom. The fourteen days from June 21—the vigil of the Feasts of St. John Fisher and St. Thomas More—to July 4, Independence Day, are dedicated to this “fortnight for freedom”—a great hymn of prayer for our country. Please see the USCCB website for more information on organizing a special event in your parish.